This week, Gecko Time interviews Cody Castellanos of ProGeckos. Cody is not only a gecko breeder, but also sells a variety of useful gecko related products online. 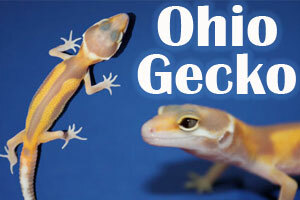 Ohio Gecko is a family business run by Thad Unkefer and his two sons Dylan, age 13, and Derek, age 11. Ohio Gecko started in 2006 when Dylan was given a Murphy Patternless and then Thad bought a couple of Mack Snow Hypo leopard geckos from JMG Reptiles. Everything snowballed for them, and their goal is to produce quality geckos while giving the boys good real life business experience. Eric from The Valley Reptile or TVR as he refers to it contacted me through iHerp to let me know what was going on in his neck of the woods. 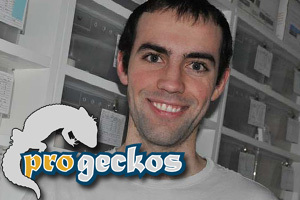 Eric is the owner and operator of TVR which he started back in 2005 with Crested Geckos only. He is located in Northern Alabama in the Tennessee Valley and here is what he had to say about his breeding projects at TVR. I got a chance to ask Daidra from Leopard Gecko Lair a few questions about what she does with her breeding projects and what some plans are for Leopard Gecko Lair. 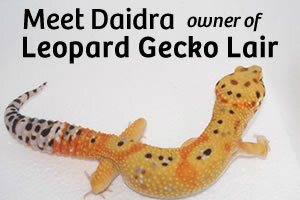 Daidra has been breeding leopard geckos for 3 years. Her basic Mission is to make healthy and vibrant leopard geckos for everyone to enjoy, whether they are breeders or just want to add to their collection of pets. Here is what Daidra had to say. I got a chance to ask Whitney Lowell about her breeding projects and a little info about goReptiles.com. Whitney started goReptiles as most of us seem to, a hobby and passion that just kept growing over the years. She has many interesting projects brewing with goReptiles. Here is what she had to say about goReptiles and her projects. This interview is the first installment of a new series of interviews being conducted by Cory from CSM Gecko. This new series of interviews is going to be done on New and Upcoming Breeders, as well as some Small Low Level Breeders that may not exactly be new. 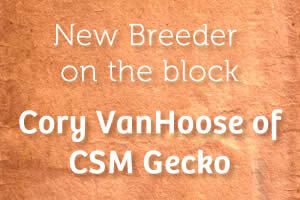 CSM Gecko is a Leopard Gecko Breeder and Supplies Online Store that Cory operates in every aspect.